Even an AWD mid-engine supercar isn't averse to crashes. The ink has just dried on the pages reporting the unsurprising news that the Audi R8 e-tron has just been killed off. The $1.1 million dollar electric supercar was simply too expensive to justify for prospective buyers and too pricey for a now cash-strapped Volkswagen to keep alive. Coincidentally, it was also the only rear-wheel drive Audi R8 that was on the market before it’s death, but as it turns out, the quattro-infused AWD Audi’s don’t do any better when it comes to saving incompetent drivers from wrecking. To prove that point, we now turn to exhibit A, this R8 V10 Plus driver who was attending a Cars and Coffee in Italy. Not wanting to be outdone by all of the Mustang commotion happening in the US, this driver decides that the exit lane is the best place to nail the throttle and get some attention. To be fair, who’s to blame them? 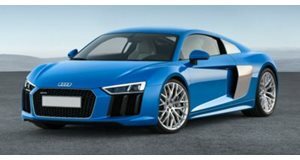 The new R8 launched with a V10 coming standard, but soon, its turbocharged inline five counterpart will be hitting the markets with what’s sure to be an exhaust note that’s lacking compared to the V10. Luckily, the damage isn’t bad, but given the name plaques fitting where a license plate should go and what’s likely the real license plate tethered to the rear spoiler, this R8 was likely brand new and may not even have been sold yet. Pour some out for the supercar.